Are you studying hard? Do you have Exams to take? Are there deadlines to meet,assignments to hand in? Do you have a job, as well as doing your studies? Is there stress in your life, and do you get very tired..... Do you find it hard to fit in your sporting interests and activities, or your hobbies, let alone relax and have fun time with your friends, or family. There is a simple way of working out these aspects of your life, if you are not enjoying them.You actually have the answers, but may not know it.....They are actually inside you! It will cost you nothing to find them: Meditation has been around for centuries, and has come back into vogue; however, you can pay quite a lot of money for some modern meditations, and these may not work. Sahaja Yoga Meditation is always Free. It is free because it is your right to experience and enjoy peace and well-being in your life, to feel the joy of life. Just 38 years ago, a very special and wise lady, who was born in a Christian Family in India,became very concerned about the way people were suffering, and not realizing their aspirations and the happiness which a human being should enjoy.This included many young people. 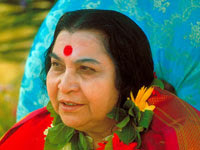 With this concern and her great compassion, Shri Mataji (this lady's name) meditated deeply and long on a solution. This solution was to raise the awareness of people. She found that we all have a special part of us in a coil, sitting in our Sacrum Bone at the base of the spine. She also found if this subtle energy could be raised, it would pass through vital energy centres called Chakras, then pass through the brain, taking stress, negativity, and thoughts away. We would then be able to go into pure meditation, and connect with the power, that is invisible, but all around us.This Power is carrying out the Creation and the Evolution. Moreover, you could actually feel the existence of this power! When this connection is made, a cool flow, a gentle breeze arises from the top of your head. You can feel it in your palm if you raise your hand above your head. 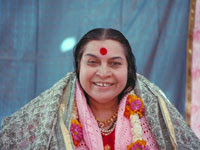 Shri Mataji named this process "Self Realization". Over the last 38 years, She has, for no charge, given many thousands of people their Self Realization. Of crucial significance to human evolution is the fact that every person who receives this new awareness, can pass it on to others, who have a pure desire to know how to achieve the meaning of their lives. So each human being can work out his/her own problems, but also work out the solutions for humanity. This is a beautiful and very simple way of finding the joy of life, in full understanding of how we are all connected. Thus we can all come together,and respect one another, and, look after one another. SAHAJA YOGA - Sahaja means"born with you": Yoga means "union" These ancient words tell us that within each of us, inside us, we can be united with Pure Knowledge, i.e. the truth about "life", its meaning, and the way to achieve our true potential, happiness, and the joy of life. 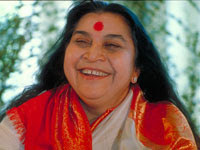 Many of us wonder if there is "Divinity", if God exists.Sahaja Yoga Pure Meditation gives you a new Awareness to approach these questions, in a wise and humble way. Actually, Sahaja Yoga is an Individual experience for each of us, but, of course, there is only one" truth". There is only one Reality. This is a Catch-22 situation- how will you know reality, unless you are connected to it- are joined to it? So, in a very simple way, with a very simple exercise, we can be connected. It works also in a simple, straightforward way. We have an eternal power within us called the "Spirit", situated within our heart; it represents Divine Love. It is not attached to anything, it is the purest of the pure. The other power we have is also very pure, and very precious, it is called "the Kundalini", meaning it is in a coil, and sits in our Sacrum- the Triangular bone at the base of the spine. For many generations this power has been sitting, waiting in a potential state. These are important times- sometimes called The Age Of Aquarius, The Age Of Enlightenment, etc. When a human being starts seeking the answers to these mystical , time-honoured questions, a subtle message is triggered to say that this human being is ready to be joined to the Truth, to Reality, to his/her own Divinity. At the always-free Classes, a Seeker can get a simple explanation of this human "Subtle System", and is shown how to raise his/her own Kundalini, and importantly, how to start his/her Meditations. These Meditations are not long, drawn-out, painful affairs, but brief and very joyous, again, "simple"- interludes of thoughtless awareness, of joyful periods of silence and peace. They are very "healing" times of about 10 minutes, where you will feel completely refreshed. 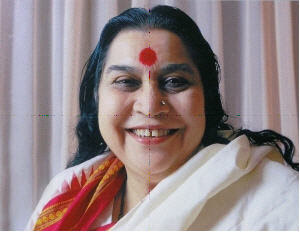 In Sahaja Yoga, Meditation is the most important area of "growth". It is not in learning and studying new information. So, people who come along, gain this new awareness for no cost: the main practice is just to sit down for 10 minutes twice a day.Let all mental activity go- be it worry, or intense work "stuff", get above thoughts, just relax, lookafter yourself, enjoy yourself.....This is not an over- simplification. None of us realize the simplicity of "Reality", we are too busy, and too complicated. Very quickly we can reduce our thinking by half, as we automatically start to "weed out" negative and unnecessary thoughts. We simultaneously start to watch and witness our busy minds, and stop getting so involved and caught up in "dramas"- many of them trivial. We actually become more alert and aware, more able to carry out our responsibilities, jobs, and life in general. Our attention becomes better "focussed", we are less stressed, and can enjoy all aspects of life. We will appreciate our families more, and this is really under attack through the stresses of modern life. If you would like to try Sahaja Yoga Meditation - remember it is Free - please have a at this meditation site for more information on how to join a Class. Most Human Beings have either a love of beautiful, artistic things, and / or a desire to create something beautiful with their own hands.This is a Divine quality. Many of these beautiful creations by people over perhaps thousands of years, are Eternal, they give joy and pleasure to us for ever...This applies to Painters, Sculptors, Musicians, Architects, and to all branches of arts, crafts, music etc. and is especially revelent for both teachers and students of The Arts. If you are one of those gifted and extremely fortunate people who both practice and love "art" and creative pursuits, here is an important message for you. This message also is for those who simply long to be creative, and artistic. In our Evolution, creatvity has been built inside us. We've all sensed that these beautiful objects of art that we see, have come from deep inside someone. In my own case, I never knew that I would ever be able to draw and paint, and be creative in other ways. There was always, for many years, a mental block, a complete inability to be "artistic". 24 years ago, after seeking answers to the meaning of life, I stumbled on Sahaja Pure Meditation. I went to a free Class in Auckland. It was incredibly simple: I raised my own "awareness" in a short meditative process, and straight away, but very subtly initially, my "thinking" changed. A lot of the old jumblee jumble of thoughts subsided. It really surprised me because I was quite intense about life. I used to think a great deal, and worry a lot about all sorts of things. Suddenly there was a new dimension in my life: a dimension of peace and an inner feeling of joy. As my life came together, I became a wiser person. I am certain it was through doing a little bit of meditation in the morning, and evening. This set me up for stress- free day, and a good rest at night. I got married after this, and we had a beautiful daughter, who, not long after she learned to talk, said "Daddy, can you draw me a house?" Somehow, I did - miraculously- then it was a horse, a truck, etc. This inspired me to go to some art classes and really see if I could make some nice drawings, and paintings. I so enjoyed these classes, and as time went by the creativity inside me came out. So from nil creativity, I was able to enjoy myself, and express that special artistic aptitude we all have inside us. recommend trying out this meditation. It certainly brings a calmness and peace to your life and when you are in "thoughtless awareness" all doubts and fears drop away. You actually do feel inspired, and that there is nothing you cannot achieve. But, don't let any thoughts take you out of your meditation: it is such a precious state to experience, and is very rare for some. If you would like to find a free Sahaja Yoga Meditation Class, go back to the Website, and click on the Links. May you find that peace and joy within yourself, and with that creativity you have inside you make a wonderful contribution to human achievements and endeavours. SAHAJA YOGA PURE MEDITATION: This is a cost-free way to achieve Pure Meditation where you can go into "thoughtless awareness". Sahaja Yoga is practiced in all 5 Continents across the world. It is Free in every country. It unites the Truths behind all the great religions. Shri Mataji Nirmala Devi founded Sahaja Yoga 38 years ago,as a simple means to bring people into a new awareness, where they would all come together in love and respect, to enjoy this beautiful creation of Mother Earth. 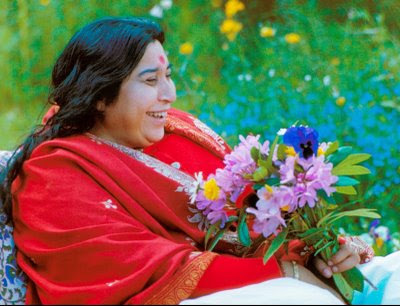 Shri Mataji found a way of raising people's awareness, "en masse", and her audiences have sometimes been in the thousands in many countries. Over countless ages, there has been built in to our physical. mental, emotional and spiritual beings, a Subtle Power that is a microcosm, a reflection, of the Divine Power that has carried out the Creation, and the Evolution. It is in a "coil" in the Sacrum bone - the triangular bone at the base of the spine. (So named by the ancient Greeks, meaning sacred) It is called Kundalini. Shri Mataji found a method of raising this energy. All it needs is a pure desire to know why we are all here, and who has created us and is sustaining us.Once we have this Kundalini Energy raised, we can pass it on, so that human pure desire triggers this "enlightenment", and carries out the fulfillment of human evolution via the Divine plan. So it works like this: a person receives their Kundalini awakening, they they then can raise the Kundalini of others, who can also pass it on. In geometric progression, this can cover the whole of New Zealand very quickly, and so it is happening across the world, in a spontaneous way, triggered by Pure Desire. The 4 parts of our complete being: physical, mental, emotional and spiritual, all get a beautiful lift, as this healing and "mothering" power brings the light of Divine love into our daily life. We become peaceful, sleep patterns will improve; we have more energy. With the inner sense of satisfaction and joy, our health improves; we think less, and in our awakened wisdom, we realize worry is both unecessary, and a waste of time. As this enlightenment of our being takes hold, we have a benevolent and very positive effect on those around us- in our homes, in our workplaces: wherever we are. This has an important effect in society, in our country, and will spread across the world.